The Israeli army and illegal settlers have been, on almost daily basis for the past two months, invading and attacking the village of Urif in the West Bank. A local doctor reports that these actions have inflicted 17 miscarriages only in the month of December, numerous injuries, sleep deprivation and significant disruption to life. The attacks occur day and night. Tear gas, rubber-coated steel bullets as well as live ammunition are routinely used by the army. The village has been the site of regular attacks over many years, but from early December 2012 there has been a significant increase. A video published shows soldiers entering a silent Urif around 1 am on the 29th December. The soldiers explode sound bombs, use an air raid siren and boast through a loud-speaker “good morning Urif, get up all the village, get up” (4:15) and then repeatedly use the horn on an army vehicle (6:28). These night incursions have become a frequent occurrence in Urif and continue up till now. Large amounts of tear gas and rubber-coated steel bullets are being used against the villagers, continually inflicting a high number of casualties. A local doctor – a primary healthcare worker, reports that there have been 17 miscarriages in the past month as a direct result of this gas. The doctor describes how his wife lost her unborn child: “After the gas entered my home, my wife started to have a discharge of blood. We went to the hospital for an ultrasound scan and we saw there was no longer a heartbeat.” He gives an account of another case: “My neighbour was pregnant for 8 months but after a gas attack they also lost their baby.” In a village of barely 3000 people, this is a huge anomaly in miscarriages. Jim, an international solidarity activist present in Urif, observed that “the gas is very strong, it has a potent effect even from a great distance and we have seen the army firing this gas directly at people’s homes. Sometimes the whole village is in a cloud of this chemical gas”. One of the villagers describes the gas further: “My face burns and I cannot breathe, it is not like the normal gas. With this gas, my sight is affected, everything is blurred and I feel dizzy”. According to other villagers, the gas also affects animals. Eight sheep have died from its inhalation, one pregnant cow miscarried and then died shortly after a still birth. The gas seems to have inflicted death to many new born puppies, too. Settlers from Yitzhar, the nearby illegal settlement, regularly throw stones at the local school and shout abuse at children inside. Recently, the army fired tear gas into the school while the children were sitting their end of year exams. 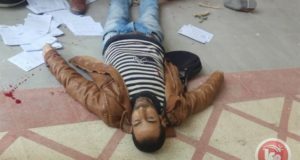 On New Year’s Day a wedding was attacked with gas and a mentally ill man was shot with a rubber-coated steel bullet, as the villagers reported to the international activists. The bullet lodged in his leg, as he was shot at such close range. On 10th January settlers were shooting live bullets, throwing stones, uprooting olive trees and attacked two houses. 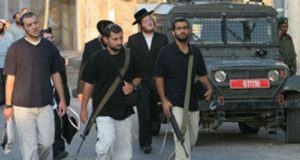 A similar scenario occurred in the village of Qusra, with settlers from the Esh Kodesh and Qida illegal settlements attacking at the same time when the attack in Urif was underway, thus raising the possibility that these were coordinated attacks. Further attacks on the local population of Urif might lead to even more miscarriages and other health issues. 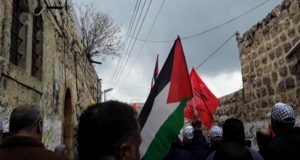 “The army must stop immediately all attacks on the village, including the heavy usage of tear gas and night rides, and prevent all settler attacks,” international solidarity activists monitoring the area near to Nablus conclude.